You may or may not already know that tungsten rings are becoming increasingly popular. If you become aware of the rising popularity of tungsten rings, you might decide that the time is right to check them out for yourself and perhaps buy one, whether you’re buying as a wedding ring or as a fashion accessory. Before buying, it is usually wise to see what a product is about for yourself. When you turn your attention to tungsten rings, you’re certain not to be disappointed! Here are the things you need to know. What is a Tungsten Ring? The first thing you need to know is that a tungsten ring isn’t really a tungsten ring. At least, the high quality ones aren’t. They’re actually made from tungsten carbide, an alloy combining tungsten and carbon, and second only to diamond in terms of toughness and durability. Your tungsten ring is going to be a lot more robust than a gold or silver alternative. 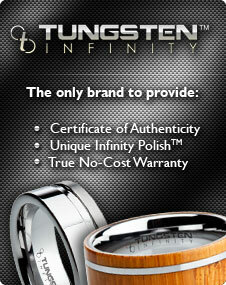 As well as being one of the hardest materials in the world, your tungsten ring will also never lose its shine. Tungsten carbide has a naturally brilliant shine anyway, and we also apply a triple diamond polish to all our rings so you’re guaranteed to never have to take your ring to the jeweller, or send it back to us, for cleaning or repair. Tungsten carbide has a melting point in excess of 6000°F, meaning it is almost impossible, not to mention very expensive, to attempt to resize a tungsten ring. As a result, when your fingers grow or get smaller through the years, you’ll need to have your tungsten ring replaced rather than resized. Before you purchase a tungsten ring, ensure you have a lifetime guarantee that covers replacements whenever you need them. Just because there are almost unfathomable temperatures involved in the making of tungsten rings, it doesn’t mean you have to have a plain and simple product. In fact, tungsten rings probably have the greatest potential of all when it comes to customization and personalization. Whether you decide you want your ring engraved with a special date or message, or would like to have a tungsten ring with a meteorite or caribou antler inlay, for example, you’ll have all options available when you opt for tungsten. If you want your tungsten ring engraved, it is best to have it performed by the retailer when you buy it. Ensure that your tungsten ring will be laser engraved, as traditional etching can damage and weaken the ring, not to mention make it lose some of its majestic appearance. At Men’s Tungsten Online, our products meet all of the pointers we’ve mentioned above; other online tungsten ring sellers even send their rings to us to laser engrave on their behalf! If you’re interested in finding out more about tungsten rings, head across to our product pages and view our full range, from basic to customized tungsten rings, for yourself.